Squizits Kit Will Keep Your Fingers Occupied | OhGizmo! By Andrew Liszewski on 03/29/11 • Leave a comment! 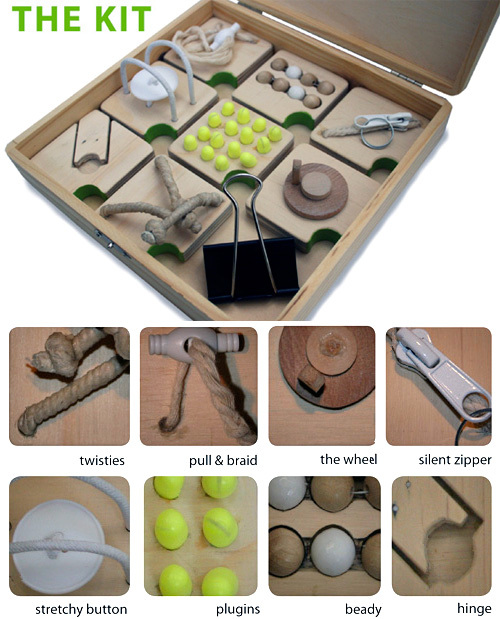 Designed by Lavinia Chu for children dealing with OCD or ADHD, the Squizits kit is a box full of 8 unique ‘fidgets’ that can be discreetly and quietly played with in hand, providing an outlet for extra energy or fidgety behavior. They include everything from spinning wheels to quiet zippers to knots, beads, elastics, hinges and plugs, and can be attached anywhere thanks to elastic straps on the back of each piece, and an included bulldog clip. (Which can be just as fun to fidget with.) Of course while designed for children, I’m sure the kit will appeal to adults as well looking for a release at work or just a way to get through a particularly long meeting.